The Tokyo Gas Group works together with local communities to implement activities based on the following guidelines for creating a sustainable society. At the Tokyo Gas Group, we seek the attainment of a sustainable society where all people can live diverse, comfortable and fulfilling lives. To that end we will work together with local communities to resolve social issues as a company that people will continue to trust and make their first choice, engaging in those activities that Tokyo Gas Group is uniquely positioned to implement. We are working together with local communities to build neighborhoods in which people can live safely and securely. Our branch offices and the company’s museums provide information on disaster countermeasures at disaster prevention events to enable us to efficiently coordinate with local authorities and communities in the event of a disaster. For example, during disaster prevention drills organized by municipal governments, we explain how to reset gas meters that have shut off during an earthquake with a seismic intensity of 5 or more. We also provide other useful information to enhance the safety and security of our customers in their daily lives. Since 2006, we have further developed our own disaster prevention events for families to enhance the disaster prevention capabilities of local communities. These events, called “Iza! 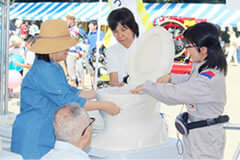 Kaeru Caravan!”, are jointly organized with Plus Arts, an NPO, and held at our Gas Science Museum. In fiscal 2017, 5,990 customers visited these events and learned skills and knowledge that may be needed in the event of an earthquake. As an activity for protecting safety and security in daily life and saving lives, we began in fiscal 2017 to widen the reach of an emergency toilet program developed from our experience of restoring gas in disaster-affected areas. We hope to nurture self-help and mutual-help capabilities for survival of disasters in local communities. To contribute solutions for global environmental issues as an energy company, we work to raise energy and environmental awareness and suggest a variety of ways for people to save energy and protect the environment in their daily lives. Eco-cooking is an environmentally sound activity that begins with the familiar daily activity of cooking. Energy and resources are consumed throughout the process from production to tidying up. Eco-cooking*1 puts into practice environmental considerations at each stage in which we are directly involved, from shopping and cooking to eating and cleaning up. *1 Eco-cooking is a registered trademark of Tokyo Gas Co., Ltd.
Children are our future, which is why we are committed to teaching them about the importance of energy and the environment and helping to cultivate a “zest for life” as the goal of school education. We organize training workshops for teachers that incorporate facility tours and group work to provide them with information about energy in general, including city gas, and environmental issues that they can use in their own instructional plans. We held 49 such workshops in fiscal 2017, with 610 teachers in attendance. 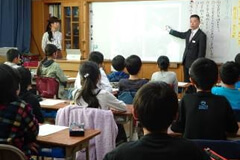 Moreover, we have been dispatching Tokyo Gas employees to teach classes in schools since 2002. As of the end of March 2018, 36,563 classes had been held with a total of 1,102,087 children attending. Two of our visiting lecture programs, “How city gas is delivered to homes” and “Nurturing eco-eating (eco-cooking),” have been approved by the Tokyo Organizing Committee of the Olympic and Paralympic Games as part of the “Yoi Don! (Get set, Go! )” Tokyo 2020 educational programs, to support children in experiencing a better future. We also provide a variety of other educational resources, such as our “Odoroki! Naruhodo! Gas World” (“The Amazing and Interesting World of Gas”) educational website that makes learning about energy and the environment fun for both children and grown-ups alike while motivating children to learn on their own. 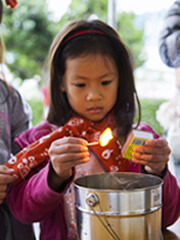 The Gas Science Museum makes learning about energy and the environment fun. It is used as a venue for out-of-school learning, and provides educational support by hosting school social studies trips and organizing workshops. In fiscal 2017, the museum received 266,448 visitors. The Donguri (Acorn) Project*2 is an environmental education program for young people that grew out of the Donguri Arbor Festival, which was launched in 1993 to counter the decline of broadleaf forests. 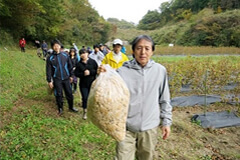 In 2005, we moved our conservation work to Nagano Tokyo Gas Forest in Miyota, Nagano Prefecture, and Donguri (Acorn) Project events began to be held there three or four times a year. By taking part in forest conservation work and experiencing a variety of outdoor programs that engage all five senses, participants learn about forest ecology and the role that forests play in our everyday lives. The hope is that these experiences will encourage people to lead more environmentally friendly lifestyles. In fiscal 2017, during two events in May and November, 56 participants learned about the ecology of the semi-cultivated Satoyama area by taking part in nature craft and forest maintenance. 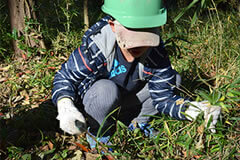 This included clearing undergrowth in the Sayama Hills in Saitama Prefecture. *2 “Donguri (Acorn) Project” is a registered trademark of Tokyo Gas Co., Ltd.
We are actively developing partnerships with government agencies, other firms, and outside organizations involved in environmental issues to raise environmental awareness in society as a whole. In light of the challenges posed by the aging population and its declining birthrate, we organize community-based activities for maintaining fulfilling lifestyles through a smart use of energy. As a company that supplies the energy needed to cook day in and day out, we encourage people to fully benefit from the use of gas flame in everyday life. Launched over a century ago in 1913, our cooking class offers a variety of subjects tailored to different participants and needs, such as “Kids in the Kitchen,”*3 which teaches children how to cook for themselves in an environmentally friendly manner using all their five senses, and “La Cucina Espressa,”*3 which shows how gas is uniquely suited for quickly cooking multiple dishes at one time. All of our cooking classes incorporate an environmentally conscious approach to eating habits that we call “eco-cooking.”*3 These classes draw 80,000 participants each year. 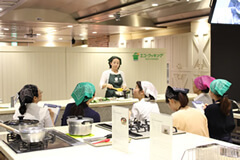 We also train instructors to teach eco-cooking, with a current total of about 3,700 instructors nationwide. Going forward, we will continue to enhance customer lifestyles and eating habits. 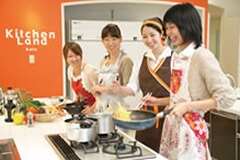 *3 Kids in the Kitchen, La Cucina Espressa, and eco-cooking are registered trademarks of Tokyo Gas Co., Ltd.
As part of our next-generation youth education initiative, we have been working since 2012 to expand our participatory HIIKU fire education program for children of elementary school age and older. The program is intended to give youngsters an opportunity to learn about fire and develop their ability to survive disasters and enrich their own lives by experiencing the various benefits of fire and the correct way to handle it. The program attracted 3,750 participants in fiscal 2017. 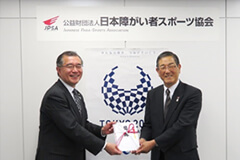 Tokyo Gas became an official partner of the Japan Para-Sports Association (JPSA) in 2013 and began offering its support to para sports. Group employees have volunteered to organize sports competitions and held viewings and supporting events. We have also partnered with local governments to provide opportunities for experiencing para sports. We believe that these activities will cultivate a better understanding of people with disabilities and serve as an opportunity to develop a barrier-free mindset. Through the activities, Tokyo Gas aspires to realize an inclusive society in which people respect and support each other and lead vigorous lives in safety and comfort. In March 2018, for the second consecutive year, Tokyo Gas donated an amount equivalent to the Paccho points collected by customers to the JPSA. 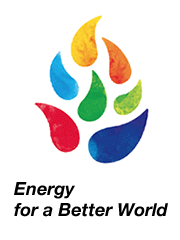 Paccho points are awarded to customers according to the level of their gas or electricity payments and can be exchanged for a donation to the JPSA. An amount equivalent to the points provided by customers and matched by Tokyo Gas is donated to a social contribution project jointly selected by the Tokyo Gas Group, in its desire to create an inclusive society, and its customers. 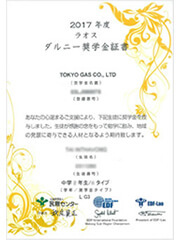 In fiscal 2017, 173 customers provided 95,900 points, enabling the general manager of the Corporate Communications Department of Tokyo Gas to present a total of 191,800 yen to Managing Director Yamada of the JPSA at a ceremony. I have devoted myself to training as an athlete at Tokyo Gas to achieve my dream of winning a Paralympic gold medal. 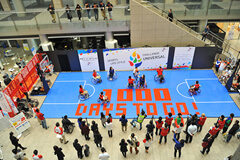 In fiscal 2017, a number of events took place to mark the three-year countdown and 1,000 Days to Go to the Tokyo 2020 Paralympic Games, and I felt the growing public excitement for the Tokyo 2020 Paralympic Games. Tokyo Gas sponsored events in Toyosu and Shinjuku, and I was able to convey the appealing, interesting aspects of Paralympic sports to lots of children. We are now two years away from the 2020 Games. The Paralympic Games in Tokyo will present a golden opportunity to see first-hand the para-athletes take on the challenge of demonstrating their potential. I hope you will come out to watch these games. Also, keep in mind that watching as many para-sports as possible and learning the game rules and backgrounds of each athlete beforehand will make watching the games even more exciting. I hope that watching the many para-sports events in 2018 will greatly increase overall awareness of the events. As an athlete, I will compete while giving it all I’ve got to earn your support. 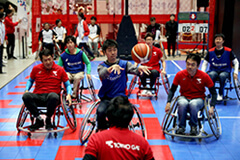 Tokyo Gas is an official partner of the Japanese Paralympic Committee in the Gas & Gas Utility Services category. Born in Shiga Prefecture in September 1990, Keiichi lost his sight at the age of two due to illness. 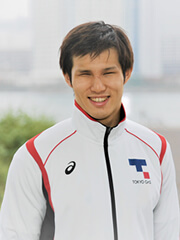 He began swimming in fourth grade and developed into a major swimming talent after moving to Tokyo and joining the swimming club at the University of Tsukubaʼs School for the Blind (the current Special Needs School for the Visually Impaired). 2008 Competed at the Beijing 2008 Paralympic Games. 2012 Won silver in the 100-meter breaststroke and bronze in the 100-meter butterfly at the London 2012 Paralympic Games. Set a world record for the 200-meter butterfly at the German Open. 2015 Won gold in the 100-meter breaststroke and 100-meter butterfly, silver in the 50-meter freestyle, and bronze in the 200-meter individual medley at the IPC Swimming World Championships. 2016 Won silver in the 50-meter freestyle, bronze in the 100-meter breaststroke, silver in the 100-meter butterfly, and bronze in the 100-meter freestyle, and placed fourth in the 200-meter individual medley at the Rio 2016 Paralympic Games. Last year Tokyo Gas held a multi-day Universal Festa on October 28 and 29 in Toyosu, and then on November 17 and 18 in Shinjuku to mark the 1,000 days before the start of Olympic and Paralympic Games Tokyo 2020. The event offered a wealth of opportunities to deepen understanding of the concept by recreating the sights, sounds and feelings of the upcoming sports competitions from panel discussions with athletes and experts on universal society and community development to activities allowing participants to directly experience para sports and using wheelchairs. The two sites attracted 4,000 visitors during the event's four days. Since February 2017, we have been organizing field trips for schools to learn about para sports. Students were able to try on sports prosthetics at the Shin-toyosu Brillia Running Stadium to gain an understanding of competing with disabilities and developed a greater interest and understanding in para sports. 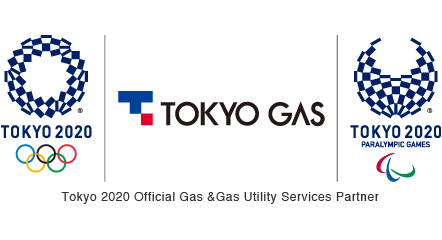 Tokyo Gas is an Official Partner of the Olympic and Paralympic Games Tokyo 2020 scheduled to take place in 2020 in the Gas & Gas Utility Services category. As a company that has supplied the Tokyo metropolitan area with energy and sustained daily life for over 130 years, we view the Tokyo 2020 Games as an opportunity for contributing to the success of the event and realizing our goal of creating an inclusive society. In particular, we will engage in activities in the areas of supporting para sports, providing services to improve the quality of life and to support communities, engaging in social issues, ensuring stable and secure energy supplies, and implementing advanced energy initiatives the Athletes’ Village and the venues in the hope of contributing to the success of the games. Moreover, we intend to continue our activities beyond the Tokyo 2020 Games by making use of the knowledge we acquire in our business. We believe that this will allow us to better meet the needs of an aging population and globalized society toward realizing greater prosperity and comfort in our daily lives and communities, leading to the creation of an inclusive society and contributing to regional development. 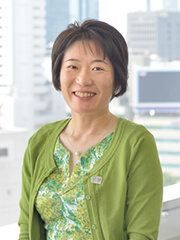 General Manager, Tokyo 2020 Olympic and Paralympic Department. In the United States, where I spent time as a student, people with disabilities were taken very good care of, even in the smallest towns that lagged behind in barrier-free infrastructure. 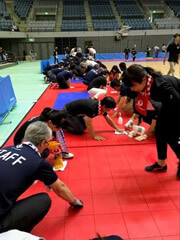 In Japan, where progress has been made ahead of the Tokyo 2020 Games in terms of physical access, such as barrier-free facilities, there is still room for improvement in terms of awareness or public understanding toward people with disabilities. Tokyo Gas will work toward the success of the Tokyo 2020 Games and support them as an Official Partner. In addition to providing infrastructure, we will strive to instill a barrier-free mindset for everyone. Supporting the Paralympic Games and para sports is the first step for Japan in becoming a highly mature society that embraces diversity. The Tokyo 2020 Games represents a great opportunity for Japan to transform itself. 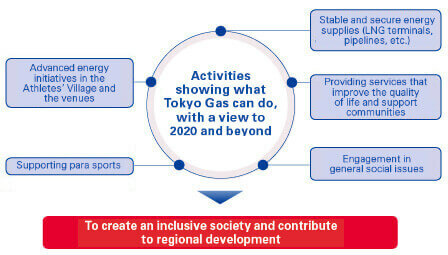 In anticipation of 2020 and beyond, Tokyo Gas will make its best effort to contribute the creation of an inclusive society. We added “sustainability” to the other six messages we wish to convey through our official partnership with the Tokyo 2020 Games as seven flames. The emblem will be used in our activities related to the Tokyo 2020 Olympic and Paralympic Games up to 2020 as well as in all of our initiatives for creating a cohesive society. We hope to carry this baton of flames to shine a light on the future. The Tokyo Gas Group provides employees with opportunities to engage in volunteer activities working alongside local communities in tackling social issues. 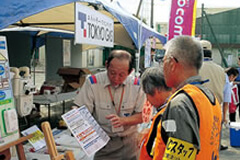 Since launching our volunteer work program in June 2011, 1,980 employees and their families have, at 43 times, taken part in support activities tailored to the needs of the areas affected by the Great East Japan Earthquake. In fiscal 2017, volunteers took part in volunteer activities to support the restoration of farmland in Higashi-Matsushima City, Miyagi, and the Fukushima Organic Cotton Project in Iwaki City, Fukushima. The purpose of the project is to reclaim the large swathes of farmland abandoned in the wake of the 2011 earthquake to grow salt-tolerant cotton, which is harvested, processed into products, and sold. In April 2017, 280 new employees at Tokyo Gas visited Iwaki to help reclaim farmland for the project as part of their training. As part of our support for para sports, we have been providing volunteers to organize para sports competitions since 2015, help set up and clear venues, staff receptions, and serve as interpreters. To date, 101 Group employees have participated in 9 events. The Tokyo Gas Group began collecting spoiled postcards since fiscal 2003 and used stamps and cards since fiscal 2017. Used stamps and cards are delivered to the Minato Council of Social Welfare in Tokyo to promote welfare and volunteer activities in local communities. The spoiled postcards are donated to the Darunee Scholarship Fund, administered by EDF-Japan (MINSAI Center), we are contributing to the education of children overseas. Specifically, the proceeds are used to fund an international foster parent program, which enables underprivileged children in Vietnam, Thailand, Myanmar, Laos and Cambodia to continue their education. As of autumn 2016, we are supporting three junior high school girls in Laos.